Have you ever thought about a career in acoustics? Join us tomorrow to learn about jobs in the field, and more from Cavanaugh & Tocci! They are an acoustic consulting company based out of Sudbury. Engineers, contractors, and architects work together to solve acoustic problems. They work in many different fields, including environmental, industrial, and architectural acoustics. 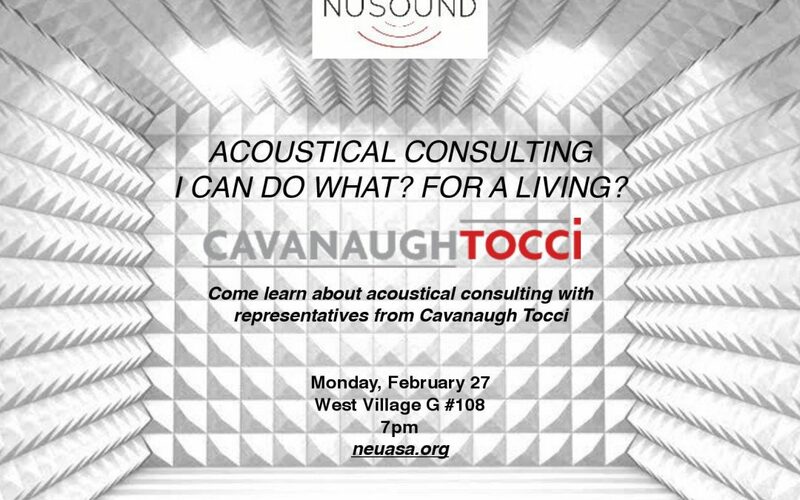 Ted, Kent, and Andy from Cavanaugh & Tocci Associates (http://www.cavtocci.com/) will present on their own unique perspectives and experiences working as acoustical consultants. Each presenter will discuss the types of projects they work on, and discuss the path(s) that led them into acoustics consulting. Following the discussion, the presenters will be available to answer questions about careers in acoustics. Ted O’Neill is a consultant in acoustics with a background in physics and music, working primarily in architectural acoustics. He graduated from Holy Cross in 2016 with a BA in Physics, and is a member of the Boston Chapter of the American Guild of Organists.Kent McKelvie is a consultant in acoustics with over 12 years experience working primarily in the area of architectural acoustics. He is a graduate of Oregon State University with a BS in Engineering Physics and is a Registered Professional Engineer (Acoustics) in Oregon. Andy Carballeira is an engineer, performer, and educator working near the intersection of art and science. A jazz organist with a passion for audio and acoustics, Mr. Carballeira has held teaching appointments at Berklee College of Music and the New England Conservatory. He holds a BM in Music Production and Engineering from Berklee College of Music and is the recipient of the Newman Medal in Architectural Acoustics. His work has appeared in venues ranging from Downbeat Magazine to The Annals of Internal Medicine.